Welcome to the start of a thrilling and very rewarding journey for you! Flying RC planes, helicopters and other types of radio control aircraft has become a hugely popular pastime in recent years, and it's never been easier - and more affordable - to get started. Not many hobbies have seen such rapid growth, nor are there many hobbies that can offer the same amount of fulfilment and satisfaction on so many levels! 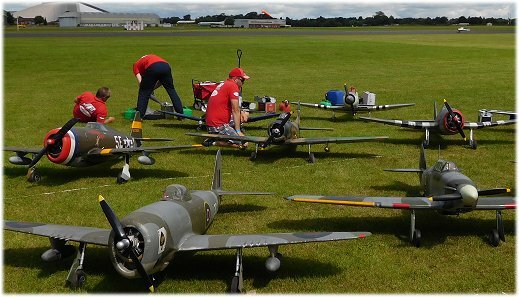 Above: large scale rc warbirds being prepped for a display. But if you don't know your propeller from your elevator, trying to get off the ground in this exhilarating and addictive hobby can be a nightmare - in more ways than one. What's good and what's not?! 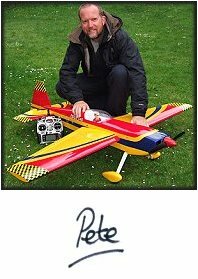 Well, that's what my website RC Airplane World is all about - cutting through the complicated stuff and introducing you to the fun of radio control flying in a no-nonsense, down to earth way. Yep, my aim is to get you flying quickly and safely, whilst saving you valuable time, money and frustration! Complete RC airplane flight school. Have a read through the ground school and flight school pages of the website to get a solid understanding of how radio control systems work and how to fly an rc airplane. The pages walk you through each step and there are some video tutorials on the flight school pages. There's also all the info you need to know about rc flight training and the different methods you can undertake, such as using an rc flight simulator. And discover why joining a club is so beneficial - use my rc flying club directory to help you find one close to home. Other pages of my site give you info on all types of radio control aircraft as well as different power types. The most popular page of the site is the beginner rc airplanes page, but you can also learn about electric planes and helicopters in general, as well as their IC (internal combustion) powered cousins. Radio control gliders, a personal favourite of mine, and rc jets are also talked about to give you an idea of what to expect from them, should you choose these type of rc aircraft. There's also heaps of technical information to help you understand what goes on in an rc model - having a healthy understanding of how airplanes fly and how you control your rc plane will greatly help you get the most out of your new hobby. 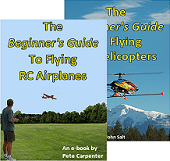 My Beginner's Guide To Flying RC Airplanes and helicopters ebooks, written by Yours Truly, will help save you valuable time, money and frustration. And if you are in to radio control helicopters, you can also find John Salt's (rchelicopterfun.com) excellent ebooks here. RC airplane plans, by Bob Bishop, can also be purchased through my site; there are 5 fantastic designs for the experienced builder. Laser cut parts sets are also available. All of the above can be purchased safely through Paypal, and the ebooks are for instant download. So as you can see, there's a lot on offer within RC Airplane World. The pages here will help you get started in this exhilarating and addictive hobby, in fact you can read some nice words from others who have enjoyed RC Airplane World and found it helpful. The fact is that there's never been a better time to learn how to fly rc aircraft; the prices of radio control products are the cheapest they've ever been, and the availability of aircraft is vast. But while this availability gives us a huge amount of choice, it can also be completely overwhelming for the beginner - so follow the advice throughout this site and you'll have a much easier ride. So please enjoy your visit and thanks for finding my website.